Ted and Josh going through hives with me in my home yard. Inspecting a Hive. What to look for. Every time you open a hive, you need to have a purpose, or goal. If you do not have one or the other, then do not open the hive. Why do you want to look in your hive? Just to see the bees or the queen? If you have no goal of getting honey, or increasing the hive population, if rolling the queen, or losing her in the grass does not worry you, then by all means, have a look! Every time you open the hive, you take chances. You may get to see your fat bottomed queen, just make sure she does not get pinched or rolled when you take the frame out. Make sure when re installing the frame she does not get squashed in bur comb, or does not run around the side of the frame to hide as you slide it back in, and squash her behind the end bar.. Jostle a frame with the queen on it, and she is likely to be the first one to fall off of that frame. If you open the hive every four or five days just to look, your bothering them, upsetting them, and stressing them. It takes them a bit of time to get re organized each time you tear their home apart. Some say a day, some say it is three days before they are completely back to normal. I honestly do not know, but suspect a day is probably closer to the norm. I am not trying to scare you, I just want you to use care, and think of the bees and your purpose for having them. So, you have a brand spanking new hive. You installed your bees a couple weeks ago, and they seem to be coming and going with great determination and energy..
For a new beekeeper, NOT getting into the hive is HARD! You want to PLAY with your new found friends! You want to look, your curious.. How much comb did they build today? Is the queen laying yet? Set yourself up a schedule and try to stick to it. May 1st through the second week in July, I inspect my bees once a week. You will be told that is TOO OFTEN by many. So let me explain. Bees swarm in the springtime. It takes nine days for them to take a queen cell from an empty cell to having it capped with a developing queen inside. Once that cell is capped, the old queen will usually take half the bees and vacate the premises. If you inspect every two weeks, you can loose half your hive between inspections. New hives have problems. They will begin preparation to supersede their queen, the new queen may start laying drone eggs because she was not well mated. Other hives can start robbing yours. There are many reasons to inspect once a week, my favorite one, is because your a new beekeeper, and the best way to learn is to get into the hive as often as possible, without overdoing it. You have a new hive, your have a schedule, you will inspect your hive or hives once a week. Your hive is two weeks old, what do you look for ? Seeing a big fat bottomed queen like this one would be Great! But often, finding the queen among all those bees is not so easy for a new beekeeper, especially a queen like this that is tiger striped. So what do you do? Keep looking until you finally find her? No, look for evidence she is there. Seeing eggs is often as difficult as finding the queen. The eggs are TINY! If you have ever hunted Morel Mushrooms, you will understand this. Once you see them, it becomes easier and easier. Finding that first mushroom usually results in a bread bag full. Find the first one, and suddenly they are everywhere! Use reading glasses, or a jewelers lens. Hold the frame so the sun will shine into the bottom of the cells. At first, differentiating the Y at the bottom of the cell from an egg is not easy, keep at it, and you will find them, and soon become proficient. I NEED reading glasses to read, and at first, I needed reading glasses to find eggs, now I can usually spot them even with my old naked eyes. Finding the queen is much the same. Go to the queens page, and look at the queens. There are differences. Her abdomen is an obvious difference. Her thorax is usually shiny, not fuzzy like a worker or drone. She also moves differently. Like finding eggs, you will become proficient with practice. Looking at pictures is good practice. Looking at VIDS with queens in them is even better. On my cut outs and swarm removal page, there is a vid of a small swarm in a bush. The queen pops out of that swarm twice in the vid, see if you can find her. You can pause the vid, replay it etc. Evidence of the queen. Eggs and young larvae is usually enough to tell you she is there and doing her job. You don't need to tear the hive down to the last frame to FIND her, just look to make sure there is evidence she is doing her job. The first two week inspection you MAY not have capped brood, depending on when the queen started laying. It will take about nine days "after" the egg is laid for the bees to start capping the cells, and that brood will begin to emerge from their cells at 21 days. In general terms, the queen will start laying about three days after she is released. She will move about the hive to spread her pheromone and become acquainted with her new home. Much also depends on the drawn comb she has available. If starting this hive on fresh new foundation it will take a few days for the bees to get it drawn for her to lay in. Often, it does not take much, the cells may not even be completed before she goes to work and starts putting eggs in those cells. At this stage, that is all you really need to look for. Make sure the combs are being drawn, and the queen is laying. The less you disturb the hive, the better off the bees will be. Each week, you can look to see how they are progressing. How much comb they have drawn, how much brood they have. A good queen lays a good solid brood pattern. It may take her a bit to get settled in and laying well, so don't panic if her pattern is not tight at first. The goal for the first year is to get both (If using deeps. Three if using mediums) brood boxes filled with foundation. Get the population of bees built up so you have a strong hive with plenty of reserves to get through winter. In a GOOD year with an excellent nectar flow, a good queen may build up a hive strong enough to produce extra honey. In a bad year, with a sub par queen you may be feeding them so they have reserves for winter. So keeping an eye on your queen and her production is important. Replacing her with a new queen if she is not up to the task early will help insure you have less work to see them through their first winter. In your second year it gets a little more complicated. Your bees ultimate goal is to swarm. It is how they multiply. Inspecting every week on a second year hive becomes even more important. Finding swarm cells like this usually means you are too late. The bottom of this cell is already chewed away, meaning this queen will be emerging within the next day or two. If you see this, DO NOT destroy the queen cells. There is a very high probability that your old queen has already left. In fact, once capped at day 9 it is usually too late. See the section on swarm prevention for more detail. Inspecting for diseases and pests is also of great importance. Nosema? Foul Brood? Chalk Brood? Varroa? Deformed wing Virus? Letting these things go unnoticed may well destroy your hive, so they should always be something you are looking for. Set the printer to fit the image to the page. I also printed it in black and white. This sheet, or one similar to it will keep you on track. If you have one or two hives it is not as difficult as when you have 20 or more. Even so, remembering which hive had what problem is easier after two weeks if it is written down. Lets go through that first inspection. You removed the queen cage on your last "look" but that was not an inspection..
Light your smoker.. You can find a lot of videos of the best way to light it. There are also a lot of recommendations for what to use as smoker fuel.. Many people like Burlap. I know beekeepers that buy it in bulk, then cut it up to use all year in their smoker.. Better in my opinion is if you have pine trees nearby.. pick up the needles, called Pine Straw, and use that in your smoker.. My wife and I have horses, so I have a ready supply of dried road apples.. I do occasionally use them, but not often.. The smell of burning road apples isnt all that pleasant.. We dont have pine trees nearby, and I have found that buying bulk burlap is more expensive than cedar shavings.. Depending on the stores in your area it may be easy to find, it may not.. I go to Orchelins, and buy the 9.99 big bag of compressed cedar shavings.. ONE bag will last me two years running 50 hives. Not an expensive smoker fuel, and it smells FANTASTIC while it is burning/smoking. Smoker lit. Approach the hives from the side or behind, and stand to the side, and or preferably behind the hive to do the inspection.. Give the entrance a light puff.. Pop the telescoping cover off. If your inner cover hole is open, give that hole a light puff. If it is not, crack the inner cover and lift it slightly, and give this opening a light puff.. Count to ten, and remove the inner cover. Give the frames a light puff of smoke, and set the smoker aside. Don't pick it up again, unless the bees begin to line up along the frames LOOKING at you, then give them a light puff again.. If your glove gets stung, if anything, including your skin gets stung, remove the stinger and discard, then SMOKE the spot to cover the alarm pheromone.. It is an imperfect cover, but is a lot better than nothing. If you allow the pheromone to build up, you will soon have dozens of bees attempting to sting.. MANY instructions tell you to begin two or three frames IN from one side or the other. The frames on the outside edges of your box have a space between them, and the side of the box. USE this space to keep from rolling or harming bees. With your hive tool, gently pry the first frame to the side. In a new hive, it may not be propolised down yet and will likely come out easily. Once they have had the chance to glue everything down it will be more difficult. It will usually come loose with a bit of a crack. Being gentle will reduce the amount of startled bees when it does POP loose. Slide it to the side slightly, and gently lift it straight upwards. The extra space should give you the room to do so without crushing or rolling bees. Pulling an outside frame also reduces the chances the first frame removed will have the queen on it.. I have found the queen on this frame. I have found her on the inner cover. I have found her crawling on my glove, and on my boot, so DONT be surprised to find her in an odd place... What we are doing is trying to play the odds.. the odds are, she is NOT on an outside frame, but it is possible so use caution! 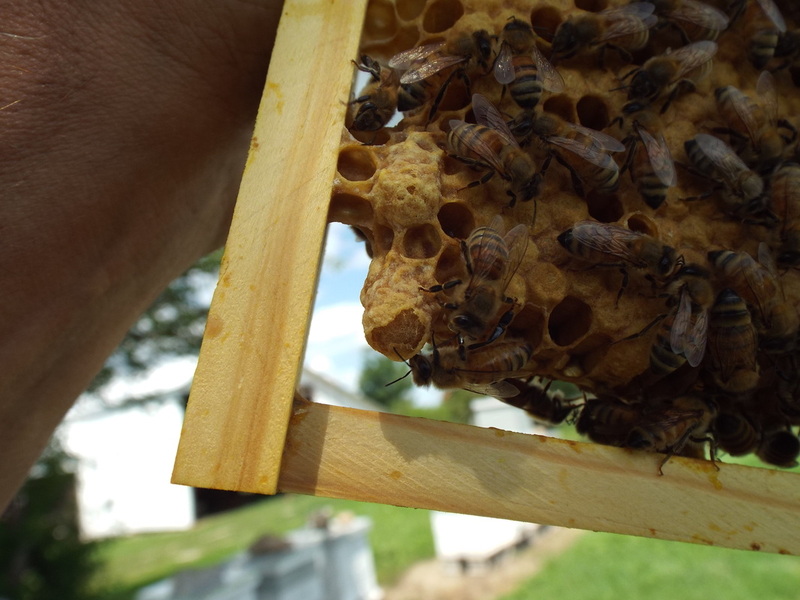 Give the frame a look to see if you see the queen, then stand it on end and gently lean it against the side of the hive. You now have plenty of extra space to remove the next frame. The PURPOSE of this inspection, is to see if the queen has begun laying. If you are using NEW foundation, the chances all of the frames are drawn out are slim.. SO were going to pop the next frame free, and simply slide it over toward the outside wall, leaving it far enough away that no bees are crushed by the side bars.. The next frame is slid over against it, being careful not to squish bees.. Continue until you get to the frames being drawn.. It often takes very little work on a cell before the queen lays an egg in that cell.. If it has been two weeks since you removed the queen cage, then you most likely have capped brood cells. You will also see bright shiny white larvae.. At this point, THAT is all you need to see. The new queen is accepted and laying. If you have GOOD eye, or reading glasses etc.. you can look for eggs.. TINY rice shaped objects stuck to the bottom of the cells..
Eggs tell you that the queen was there within the last three days, nothing more or less. Seeing the queen is great, but not necessary, so long as you see the evidence that she is doing her job. At this point, you can carefully slide the frames back where they belong, re install the frame you removed first and close up the hive. In all honesty, a newly established hive should not need to be inspected more than once every two or three weeks to insure they are growing, and so you know when to add the next box of foundation. It is not often a newly established hive, with a new queen, will swarm in the first year.. possible, but not probable. Your next inspection will be to check for continuance.. there should be more brood, more bees, and more frames drawn, and being drawn. 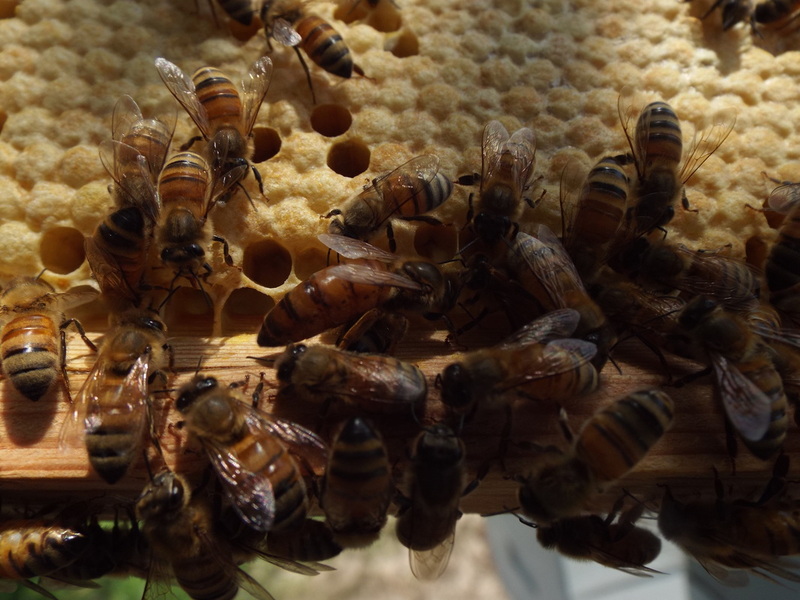 If you DO find queen cells in your new hive, the chances it is swarming are VERY small, it is more likely that the bees are superseding the queen.. LET THEM! It is highly probable that you will even find the NEW queen, and the old laying in the hive at the same time.. The old queen will eventually vanish.. At the very least, the new queen will be locally mated, and will have a better chance of wintering successfully. Time in each hive is variable.. Ten minutes is usually enough to accomplish most goals. I have had hives open for 30 minutes, but usually after about ten minutes the effects of your smoke to calm the bees begins to diminish. Time of year will also have an impact on the amount of time you can spend before they begin to get aggravated. There are many factors to consider.. if you have a skunk bothering the hive at night, eating the bees that go out to see what the fuss is, they are likely to be intolerant of any inspection. I read all the time where folks realize their bees are upset, so they close up the hive and wait for another day.. Perfect! thats what you need to do. I personally dont have the luxury of doing that. When i inspect a hive, they ARE getting inspected if they like it or not, so I have a good bee suit. That way I dont have to set aside other plans if I have a hive or three thats having a bad hair day. As the seasons change, the purpose of inspections will begin to change. First year packages do not normally have a problem with excessive mite populations, but it should be checked around August. If you have multiple hives started that year.. the weak ones should be combined, so you have time to strengthen and feed them to prepare for winter. You need to look for the winter stores/reserves If the bees have not put up enough reserves, you need to get feed on them, also in August. In spring, feed 1/1 syrup to encourage brood rearing. In fall feed 2/1 syrup to encourage storing it. They need time to get the syrup packed away, dehydrated and capped. So look at how much they have available.. Depending on your location, they might need 100 lbs of capped syrup to survive the winter. They may only need 30 lbs if your further south.. 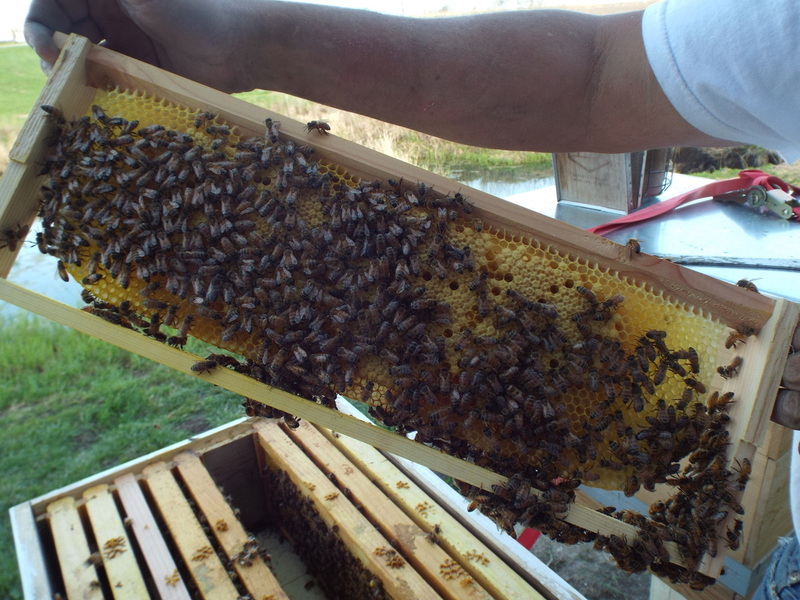 Check with more local beekeepers to get the standard for your particular parallel. The second year, you need to be inspecting those hives for swarm prep, as well as all of the stuff you normally check for. Hopefully, by the time the second spring arrives you will be psyched up and READY! If you have questions, or just want a little confirmation on a decision, PLEASE go to worldwidebeekeeping.com and register, then make your first post the question. Having HUNDREDS of years of combined experience at your fingertips is an invaluable resource!